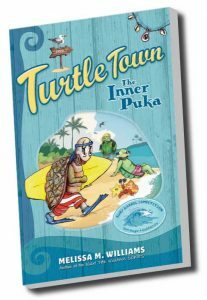 The first book in the Turtle Town Series, The Inner Puka, is about Snap Shell, a box-shell turtle from Texas, who must find his place among a society of surfing sea turtles along California’s southern coast. 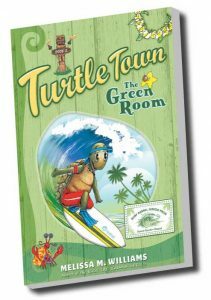 Snap Shell, the box shell turtle we all loved from the Iggy the Iguana series, has waited his whole life to follow his dream of becoming a real surfer. When his father is transferred to California, Snap gets the chance to embrace the much sought after waves of the West Coast. He faces many challenges, due to his physical differences from the other sea turtles. Good thing he brought his trusty blue flippers! On Snap’s journey of becoming the only surfing box shell on the beach, he discovers long hidden secrets that will have the power to either destroy him or truly help him find the inner puka of his soul. Opportunities of a lifetime continue to knock on Snap Shell’s door, now that he is Turtle Town’s new Box Shell Surfing Champ. Fame, fortune and free surf gear taste sweet in the beginning, but soon Snap realizes popularity comes with a heavy price. On Snap’s journey to find the meaning of Aloha, he discovers that the powerful spirits of the islands strive to keep balance between the animals and nature. However, while venturing through uncharted waters, Snap encounters a horrific situation, which threatens to ruin his entire professional surf career. Will Snap sell out or stand up for the future of his brother species? While trapped on the Forbidden Island of Niihau, Snap Shell is forced to witness the near destruction of an endangered shark population. Surfing will become his only chance for freedom when he is whisked away to Australia, where he will meet some of the most interesting creatures on earth. While he is there, the box shell turtle notices there’s something strange going on in the water. 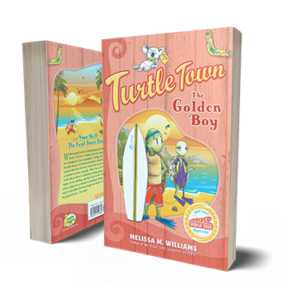 In this thrilling and final book in the Turtle Town series, Snap is on a mission to end shark finning for good, only to encounter the most dangerous battle of his life with his greatest love … the ocean.